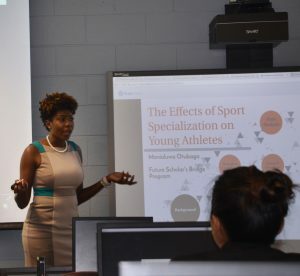 This summer marked the seventh consecutive year that Kinesiology Professor Jared Russell, Ph.D., has hosted the Future Scholars Summer Research Bridge Program. The program began with the intent of increasing the cultural and ethnic diversity in the College of Education’s graduate programs, and sending scholars of color into the academy. The program, by any measure, has been a spectacular success. The program began in 2010, when Russell reached out to faculty at his alma mater, Morehouse College (Atlanta), which has its own undergraduate Kinesiology program. He also established relationships with Spelman College (Atlanta), and Albany State in South Georgia. These are three of the state’s historically black colleges and universities (HBCUs). On these visits, Russell talked to promising undergrads about Auburn University as a place to do graduate work and conduct research. To his surprise, few had ever heard of Auburn, much less considered coming here. Russell pointed out something that former Auburn president Jay Gogue said many times: most students who come to Auburn already have a strong Auburn connection. And that usually means a family member. 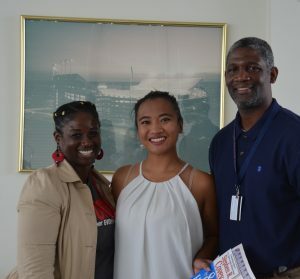 In the program’s first year, ten students enrolled in the Summer Bridge program. Six of those students went on to enroll in graduate school here. Over the years, Russell said, approximately 80 percent of the Bridge students end up coming here to graduate school. After his initial success in Georgia, Russell’s recruiting territory expanded to Tuskegee University and Alabama State University, both close to Auburn. He expanded the program again to include students from Tennessee State University in Nashville, Florida A&M University in Tallahassee, and North Carolina Central in Raleigh. A recent Kinesiology doctoral grad, Desmond Delk, is on the faculty at Langston University in Oklahoma, so students have started coming from there. And the program is well-known within the ranks of the American Kinesiology Association, which has led students to Auburn from as far away as the University of California – Fullerton. The six-week program, which runs from mid-May until the end of June, is as much about preparing students for the rigors of graduate studies as it is about conducting research. The students are in class every day, and work with faculty members on a research project they select themselves, but there is also much more going on. All of these activities involve current graduate students, and most sessions are actually designed and implemented by past Bridge program participants. And the work starts long before the Bridge students arrive on campus. Isolation for traditionally underrepresented students is a real issue at Predominanly White Institutions (PWI), so the mentors help them understand that graduate school is a collaborative venture. 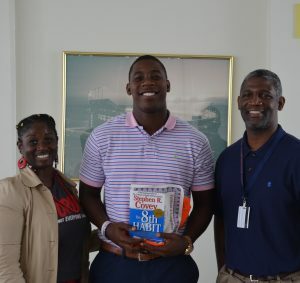 The mentors help encourage socialization and becoming part of the larger Auburn University community. The cost of the summer program is approximately $5,000 per student. Much of that funding comes from an annual gift from the Charles Barkley Foundation. Russell very much wants to expand the program to include other units in the College, but funding remains the sticking point.